Hi all. A mate at work whos brother works over at the printers gw use was back home for easter this past weekend and shared some intresting things. DARK ANGELS are aparently next and set for next couple of months. Aparrently stuff we have heard re chaplin wolfguard style units is not far from the mark. They are to get a new speeder varient. I was also told of a new psychic power that works similarly to some sort of shield that a necron unit gets. Basically it forces a unit targeting librarian to hit an allied unit instead. Not familiar with new necron book so not sure what that is. Know it is not much . Second hand info and all but his stuff matched what i had read here so thought i would pass it on. Anyone able to add anything? 4) It has been reported that the Chaos Codex was ALREADY BACK from the printers and in the distribution channel as of late March. Even if true, this information places the Dark Angel codex behind the Chaos Codex. So now it looks like Chaos Marines and Dark Angels (in some order) for 2012, with 6th Edition sandwiched in between. ~Full thread on the BoLS Lounge here. 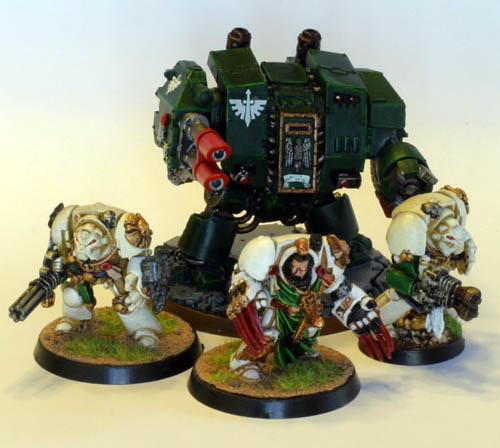 Previous Dark Angels rumors here. Have at it folks.